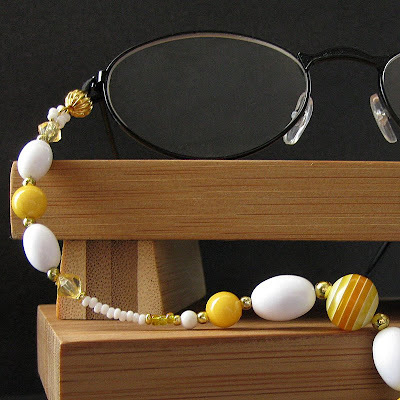 Daydreaming of sunsets and warm summer days, this beaded eyeglasses holder is the reincarnation of that lazy daydream with sunny yellow beads combined with a set of striped yellow-to-orange beads that are reminiscent of a summer sunset. Combined with these cheerful yellow shades are snow white touches that accent the yellow theme and a bit of gold plated accents for shimmer. This handmade eyeglass chain is perfect for leashing in reading glasses to make sure they don't run away and hide at an inconvenient moment.